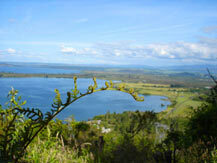 Located in the centre of the North Island is the stunning Rotorua - Taupo region. This region is popular all year round, with activities such as world-renowned trout fishing, skiing, pristine native bush walks and treks, and of course relaxing in the geothermal hot springs. Tourists have been flocking to Rotorua for over 200 years. Infact Rotorua was one of New Zealand's first tourist destinations. In Rotorua you can enjoy a showcase of Maori cultural activities. Of particular note is the award winning Tamaki Maori Village, where visitors are welcomed on to the Marae (meeting grounds) and entertained with traditional song, shown activities such as weaponry displays and poi twirling, before being fed a traditional hangi meal. Another area of particular interest to tourists is the Buried Village located just 20 minutes out of Rotorua. Te Wairoa Village was buried by rock, ash and boiling mud in 1886 with the violent eruption of Mount Tarawera. Today the village has been excavated and provides an insight into a time gone by. The region is most famous as a geothermal wonderland, with boiling mud mud pools, geysers, and steaming craters. If you are seeking a little rejuvenation and relaxing, this is the place! Soak all the stress away in one of the many hot spring spas. Some of the best trout fishing takes place in Lake Taupo/Tongariro River. Turangi has been called "The Trout Fishing Capital" and while you are there make sure you visit The National Trout Centre on S.H.1 which includes an underwater viewing area. Lake Taupo has so much to offer. Of course it's famous for trout fishing but other attractions include: internationally acclaimed golf courses, the famous Maori Rock carvings at Mine Bay, boutique shopping and fantastic restaurants, cafes and bars. The links below will help you guide your search through all the information on KiwiWise regarding New Zealand's heart of the North Island, the Rotorua - Taupo region.